They say that a journey of a thousand miles begins with a first step. The first step that we at Villa Sol took was to commit ourselves to offering our customers a leisure experience that's a step ahead of their expectations. In our world of leisure, we focus on all those little details so that our customers can leave their cares behind and concentrate on just one thing - having a great time! An architecture that is contemporary, and yet reflects the recent past withits distinct character sets the Villa Sol apart from the monotony of today's constructions. Our property will leave you with all the time in the world to laze in the swimming pool, shoot some pool, have a chilled beer in the most stylish pub in Goa or simply take a walk on the beach which is a 2 minute walk from the property itself. Located in the serene surroundings of Dona Paula Plateau, with a breathtaking view of the Arabian Sea. 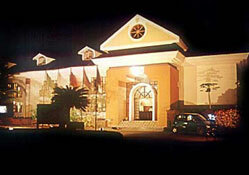 Villa Sol is located 10 minutes away from the the capital city of Goa, Panaji. Our expertise, of course lies in pampering the taste buds, whether at the multi-cuisine restaurant or the pure veg. or the poolside Barbeque. The poolside Barbeque every evening provides a grand finale for a perfectly relaxing day. Swimming pool, Pub Disco, Popular multi-cuisine and seafood restaurant - "ORCHID", Running hot and cold water, Courteous Service, Laundry Services, Money Changing Facilities, Safe Deposit Lockers, Evening Entertainment, Billiards area, Communication Facilities, Doctor on call, Taxis on call, Barbeques. The Villa Sol rooms are air-conditioned, tastefully furnished and luxuriously spacious. Elegantly done up in pastel shades, the rooms overlook the rippling swimming pool and also provide a scenic view of the Dona Paula Bay. Our rooms provide a cozy and a homely ambience - it's a nice place to be in after a hectic day out. Your air-conditioned room... A cradle of cool relaxation!! !